Scientists overwhelmingly agree that preventing the worst impacts of climate change will require limiting warming to 2 degrees C (3.6. degrees F). The world’s “carbon budget,” or the amount of emissions it can release and still stick to the 2-degree limit, is 986 GtCO2 between 2011 and 2100. Failing to stay within this budget could warm the planet past key tipping points, which would bring dire consequences such as wilted croplands, bleached coral reefs, mass extinctions of animals, and some regions such as North Africa and the Middle East becoming uninhabitable. Fossil fuel companies have enough carbon stored in reserves to take us well over the 2-degree threshold. Preliminary analyses show that the 200 largest publicly traded companies (by reserve size) have at least 1,541 GtCO2 worth of potential emissions stored in their reserves, or 156 percent of the world’s carbon budget. Alarmingly, this figure is based only on fuel burning, leaving out an important emissions source – the production and processing of the fuels. 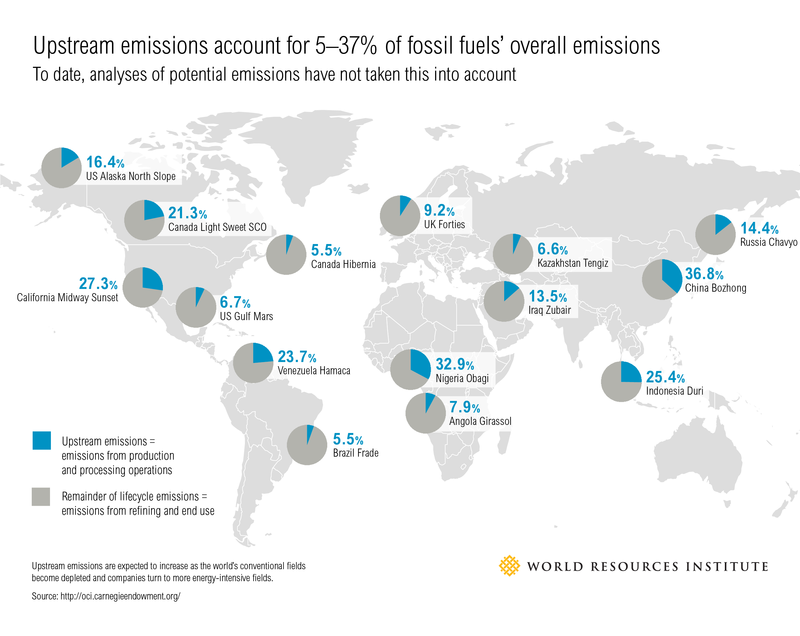 These upstream sources account for between 5 percent and 37 percent (an average of 15 percent) of fossil fuels’ total emissions, from exploration to consumption. New analysis by Reuters shows that 48 percent of the world’s 4,400 largest companies report their emissions to investors and stakeholders. This disclosure trend will continue, as socially responsible investing has grown 10-fold since the 1990s and continues to outpace other strategies. Investors are most concerned about the future performance of companies, and data on potential emissions from reserves in the ground offer valuable information about a company’s future prospects. Increasing climate protection policies, like Canada’s carbon tax, could affect the valuation of their assets and eventually profits, so it’s essential for investors to know the potential emissions so that they can calculate the expected liability. Investors have already collaborated on a number of initiatives to standardize the disclosure of carbon-related data and improve data availability in the fossil fuel industry. For example, CDP’s annual climate change questionnaire has a module tailored to the oil and gas industry that calls on companies to disclose production and reserves by reserve type, emissions by stage in the value chain and development strategy. The Global Climate Disclosure Framework, a reporting guide issued by the Institutional Investors Group on Climate Change, Ceres and the Investor Group on Climate Change, calls on oil and gas companies to disclose the carbon intensity of their operations. Potential emissions data offers a complimentary perspective here because, when combined with data on reserve size, it is an indicator of the carbon intensity of future production. In order to keep global temperature rise within range of safe levels, fossil fuel companies will need to consider a major shift in strategies, including limits on how much of their reserves they would use. Indeed, we’re already starting to see how this scenario could play out as a result of dropping oil prices. For example, Exxon Mobil recently announced that it no longer considers 20 percent, or 4.5 billion barrels, of its proved oil reserves to be extractable. This reduction applies mostly to the company’s oil sand deposits in Canada, which are expensive to extract and use, and therefore particularly sensitive to dips in oil prices. The write-down is possibly the largest single-company revision in the history of the industry. This example suggests what governments could accomplish leveraging market forces to achieve their climate policies.